If you’re doing any kind of remodeling project, the odds are good that lumber will be a necessity. This is especially true if you’re adding on a room or building a whole new home for your family. Even many smaller projects, though, such as building decks and adding beams to ceilings, involve the use of lumber. Purchasing this material can be easier said than done. The lumber industry is large, and it is often tough to know precisely what you need to buy for your next project. This guide is here to help you make the right choices when you start shopping. 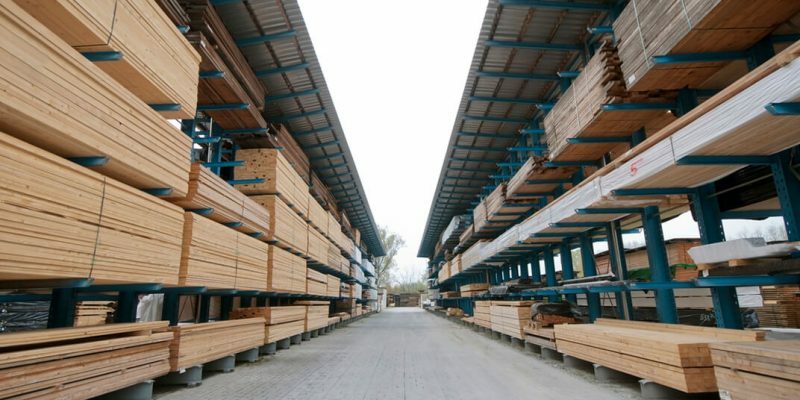 When you begin shopping for lumber for your project, you’ll soon realize that there are numerous terms and phrases with which you might not be familiar. In this section, you’ll discover some key definitions that will help you as you select your lumber. Softwood – Softwood is harvested from coniferous trees and is generally less dense than hardwood. Typically, softwood is not used for major construction projects, like house framing, deck building, or flooring. Hardwood – Hardwood, including popular options like oak and maple, is harvested from deciduous trees. There are varying levels of hardness, with certain tropical woods like ipe being the hardest on the scale. Typically, the harder the wood, the more costly it is. You can, however, find good deals if you keep your eyes peeled or talk to your contractor. Green – There is a fairly common misconception that “green” wood has a greenish color, but this is not the reason for the term. Instead, “green” simply refers to newly harvested lumber that has not been seasoned or treated in any way. Typically, “green” lumber is not a good choice for outdoor projects in particular; it will not resist insects and inclement weather. Moisture rating – The amount of moisture in a piece of lumber depends on several factors, including how long ago it was cut down and what sorts of chemicals have been used to treat it. All lumber has a moisture rating. A rating of “S-GRN” means the lumber is green, a rating of “S-DRY” indicates the lumber has under 19% moisture, and a rating of “MC-15” assures buyers that the lumber has under 15% moisture. Your contractor will be able to tell you which option is best for your job. When you start getting cost estimates for lumber, you are likely to notice that your quotes indicate the price of a board foot. This refers to a one-square-foot, one-inch thick piece of wood of a given type and grade. A 12-inch long 1×12 and a 12-inch long 2×6, which is double the thickness, would both qualify as a board foot. Lumber sizing can be extremely confusing for novices. Fortunately, it’s not too hard to get the hang of. The main thing you need to be aware of is that the “surfaced size” of a piece of wood is smaller than its description indicates. A standard 2×4, for instance, is really 1 ½ inches thick by 3 ½ inches wide and a 1×12 is truly ¾ inches thick by 11 ¼ inches wide. Lumber store employees or your contractor can assist you if you need help the first time or two you shop. Hopefully, you’ve become far more familiar with how buying lumber works from this short guide. You should, of course, never hesitate to ask your contractor questions if you’re confused about anything regarding your upcoming renovation job. Furthermore, the staff at your local lumberyard is sure to be happy to assist you. With practice, you’ll be shopping for lumber like a pro! Renovating a home is a big job, but is also a worthwhile one in most cases. Typically, homeowners who decide to go through with large remodeling projects are extremely glad they did so in the long run. This does not mean, however, that the process isn’t stressful, even if you aren’t doing it yourself. As a matter of fact, some people find it even more challenging to coordinate with teams of designers, contractors, and other professionals. Fortunately, there are a number of steps you can take to make things as easy as possible for your family during a renovation. You’ll find some great tips below. Make sure you and your contractor have regular check-ins regarding your project. This way, the two of you can make sure you’re on the same page, specifically from a materials standpoint. These meetings are particularly crucial if you’re supplying some of your own materials. If, for instance, you are adding new windows to a room, you need to make sure the panes and frames have been ordered before your contractor begins cutting holes. This way, you won’t have open spaces in your walls for an extended period of time. Although you might be tempted to leave town while your home is being remodeled, it’s best to stay as close as you can. This way, you can oversee the project, make sure things are progressing at the agreed-upon pace, and make decisions about various finishes that might not have been selected at the onset of the job. If you cannot remain in your residence due to the nature of the renovation, consider staying with close friends or relatives; another option is to move your family to an extended stay hotel in your area for a short period of time. Because there will undoubtedly be times when your contracting team is in your house without anyone present, it is imperative for you to post any rules you have in at least a couple of highly visible locations, such as bathroom mirrors, the refrigerator, and the front door. These rules may include things like whether or not your bathrooms and kitchen can be used by renovation professionals, whether or not your pets are allowed to be put outside, and whether or not your home WiFi network is allowed to be used by those outside the family. While you might think this tip is merely intended to deter theft, it actually serves another purpose as well. The odds of something getting accidentally broken during a renovation are relatively high, so it’s a good idea to keep everything that is truly valuable to you in another location, such as a storage unit or a family member’s residence. Remember, some of these items may have sentimental value rather than monetary value. Hopefully, these suggestions will help you have a smooth remodel and will make your family’s life less stressful over the course of the next few weeks or months. If you reside in North Carolina or South Carolina and are interested in discussing your renovation with the Hatch Homes team, don’t hesitate to give our office a call today. We would love to work with you to create the home of your dreams! Whether you are having an entirely new home constructed from the ground up or you’re just adding onto your current residence, house framing is something that most laypeople don’t know too much about. Understanding the process, though, can help you have more meaningful conversations with the construction professionals who are working on your project. You don’t have to know a lot about house framing to be able to discuss your job; the basics will still be helpful. As you read this brief guide, you’ll become familiar with some key points that will elucidate the house framing process. Know what materials you want to use. For thousands of years, the materials used to frame and construct buildings were taken from local regions. Stone, for example, to erect structures in medieval Europe and clay in ancient Egypt. In today’s world, though, materials can be sourced from just about anywhere on earth and quickly reach their destinations. Many modern homes are framed using wood studs, which you’ve probably heard of even if you’re a complete construction novice. If, however, you are interested in using other materials, simply talk to your contractor to find out what can be done to suit your vision. Steel, concrete, fiberglass, and specialty woods, such as tropical ipe, can all be procured for a price. As long as your budget allows you to pay for the materials you desire, you can get just about anything delivered for your project. In addition to the material or materials that will be used actually to frame your house, your contractor will use numerous types of screws, nails, and bolts, washers, and other wares to make sure the construction is sturdy and meets various codes. It’s a good idea to make sure your area doesn’t have any special regulations before your project gets underway; some coastal parts of the Carolinas, for instance, require buildings to be able to withstand hurricane-force winds. Grasp the importance of the foundation. Without a good, solid foundation, your new room or new home is likely to start falling apart far more quickly than it should. If your foundation isn’t constructed correctly, you can spend all the money in the world on expensive construction materials, but your new space won’t last very long, at least without costly repairs. Make sure you hire a well-respected team to handle your job. This way, you can rest assured that the foundation is being poured perfectly and you won’t run into problems down the road. Learn about house framing techniques. There are several different ways to frame a house or even just a new room, and it is essential for you to have some idea of what tactic is being used during your project. This will help you be more aware of what is happening from day to day and, should any issues arise later, will make it easier for you to talk to whoever is doing the necessary repairs. Remember to specifically ask which walls in your residence are load-bearing and how your doors and windows are being framed-in. This will be useful information to have at your fingertips if you ever do any major renovations. Even though you aren’t going to be framing your new space yourself, learning more about the topic is an excellent idea. Hopefully, the information here has piqued your interest in some way, and you will spend some time doing further research or having an in-depth conversation with the contractor you’ve hired to oversee your project. Storm doors and screen doors are essential for most North Carolina and South Carolina homeowners. Not only do they help protect costly exterior doors, but they aid with both energy efficiency and insect prevention. Storm doors add an extra layer to ward off cold winds in the wintertime and muggy air in the summer. Additionally, bugs are a significant problem in many parts of the Carolinas, particularly in the summertime, and screen doors are a lifesaver for homeowners! 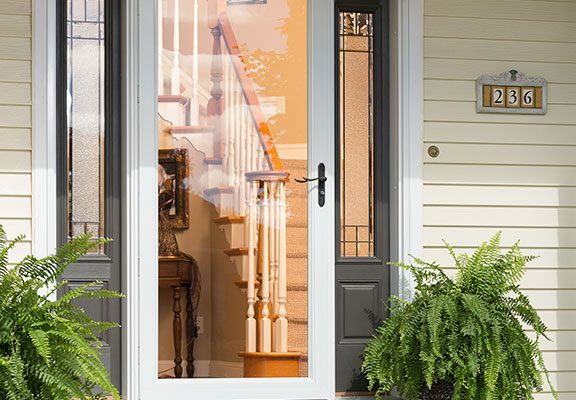 If you’re thinking about investing in a new storm door or screen door soon, the information in this guide will help you pick the right product for your needs. Nowadays, both home builders and door manufacturers use standard sizing to make it easy for homeowners to shop. In regard to storm doors and screen doors, standard widths are 30 inches, 32 inches, 34 inches, and 36 inches. They can be hinged on either the left or the right depending on which model you buy; some styles are available both ways. Storm doors and screen doors are generally pre-hung, which means they can be attached to the door jamb you already have. If you live in an area of North Carolina or South Carolina where you know you will need both a storm door and a screen door at various times of the year, you might want to consider investing in a combination storm and screen door. This type of product features a removable front panel and includes both a glass pane for wintertime and a screen for the warmer months. Combination doors typically have high-quality pneumatic closing mechanisms that help these doors shut smoothly for years. Furthermore, they are generally quite aesthetically appealing. In past decades, such as the 1960s and 1970s when screen doors rose in popularity, aluminum frames were just about all the market had to offer. Today, though, brands have a wide range of materials and colors available. Vinyl storm and screen doors are extremely durable and affordable on most budgets. While these door frames are generally white, other hues, such as forest green and ecru, are also available. Even aluminum storm and screen doors have come a long way since they were first introduced. Modern options feature embossed wood-look textures and come in not only conventional silver but white and various browns as well. You can even order completely custom storm and screen doors from some companies. Recent storm and screen doors all generally have insulated wood cores with aluminum cladding. This makes them more durable than older models. There are also composite storm and screen doors available through certain manufacturers. The team at Hatch Homes can assist you with any door installation project, whether it is a standalone job or a small portion of a much bigger renovation. Call our office to schedule a consultation with one of our experts and to learn more about how we can help you create a home that you and your family can be proud of for decades to come. While many homeowners don’t give their entry doors much thought on a daily basis, they are an extremely important part of the overall look of any house. If you haven’t ever replaced your front door, or if it has been many years, now might be the perfect time to start looking for a style you love. You are sure to be amazed by how much changing your front door can alter the entire aesthetic of your home’s entryway. Below, you’ll find some helpful shopping tips. Depending on the age of your Carolina home, you may have a wooden, steel, or fiberglass front door right now. The older your residence is, the more likely it is that the door is made from wood. Although wood doors are absolutely beautiful, they do tend to age more quickly than some other materials when they come into contact with the elements. Adding a storm door is a great way to slow the weathering process, but it’s still something to keep in mind as you choose a material. Wood doors also tend to be the most expensive option on the market. Steel and fiberglass doors are both immensely popular among today’s homeowners, due in large part to their durability. Both of these materials can be expected to last for decades with very little regular maintenance. Typically, steel doors are less expensive than fiberglass varieties, but some homeowners find that it is worth it to spend the extra money because fiberglass is both long-lasting and resistant to a variety of weather events. There are a number of potentially unfamiliar terms you might encounter while shopping for your new front door. The more you understand the terminology of the door manufacturing industry, the easier it will be for you to communicate exactly what it is that you want to purchase. In this industry, for instance, the term “composite” refers to any door that is not made entirely of a single material. This is quite common nowadays. 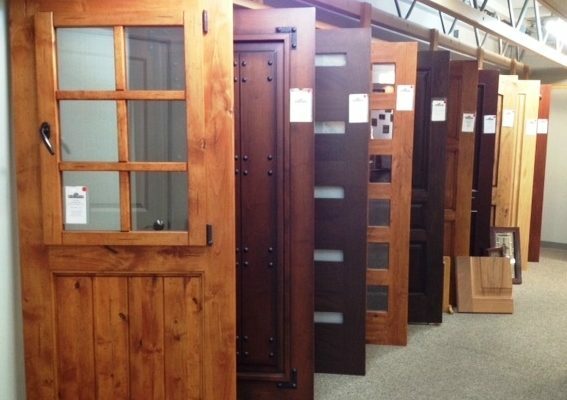 In fact, even many wood doors are considered composites because they have steel cores or foam insulation cores. “Flush” and “paneled” are also important terms to know. These are somewhat self-explanatory but refer to whether or not entry doors have recessed areas (panels) on them. Some homeowners like the look of paneled doors, while others prefer completely flat (flush) styles. Figuring out where to buy a new front door for your home can be more challenging than you might expect. You’ll have to decide whether you want to order a custom door from a local North Carolina or South Carolina millwork company, buy an off-the-rack door from a big box retailer, or place an order from any number of online manufacturers. If you are struggling to come to a decision, talk to your contractor. He or she will be able to help you figure out where the best place to get an entry door that fits your needs really is. Furthermore, he or she may even be able to get discounts you can’t receive as a non-professional, allowing you to get a more expensive door than you thought you could afford. The team at Hatch Homes would be happy to assist you with your entryway project, from installing your new door to doing any other projects that will spruce-up your space. Give us a call today to schedule a meeting with one of our experts. We can’t wait to meet you! Choosing the perfect shade to paint your house can be a difficult task, particularly if you’ve never redone an exterior in the past. 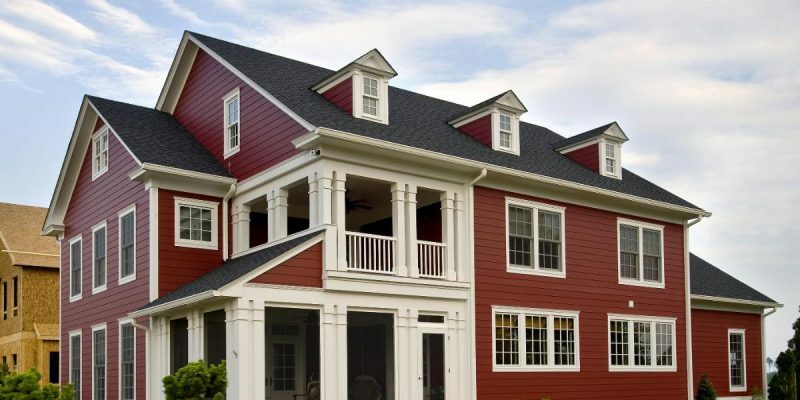 In this series, we’ll be taking a look at reasons to select various colors for the exterior of your home as you prepare for your upcoming renovation project. Hopefully, one of the articles will speak to you and make it easier for you to select the ideal hue to fit your vision. In this guide, you’ll discover some reasons to choose yellow. 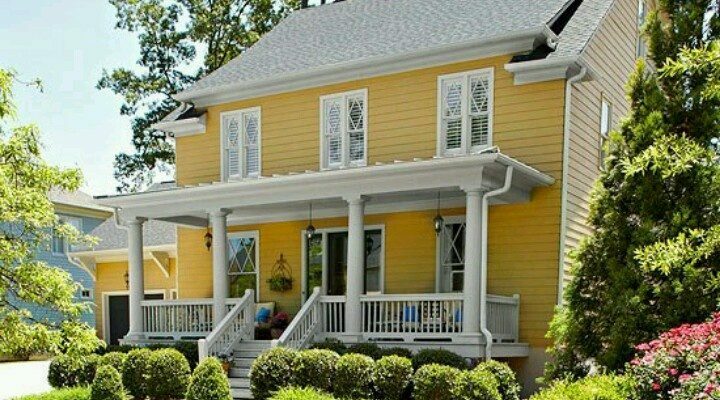 Yellow has been a popular exterior color throughout a number of historical eras. From ancient Italy, where Tuscan villas were often painted in buttery yellow shades to the Victorian age when homeowners frequently used bright yellow shades as part of colorful palettes, you can’t go wrong with a yellow hue if your house is either very traditional or a relic of a bygone era. If you are concerned about what shade of yellow is the best choice, don’t hesitate to work with a designer who offers color consultations. Stucco is not a common exterior covering in some parts of our service area, but in certain regions, such as Charleston, SC, and the surrounding area, there are quite a few homes that feature this material. Stucco looks great painted in pastel shades, such as pink, pale blue, and light yellow. Therefore, this sunshiney color should definitely be on your radar if you’re renovating a stucco-covered residence. If your house features exterior wood trim that is darkly stained, yellow is a great primary color option. Nearly all shades of yellow contrast perfectly with dark wood, giving your home a rich, warm look that will welcome visitors and household residents alike. A great way to make this look even more aesthetically appealing is to pair your existing yellow and deep brown color scheme with blue or deep green accents, such as shutters and light fixtures. Although it looks much different than stucco, board and batten is another exterior material that lends itself to being painted yellow. Buttery tones look great on this house covering and will give your residence a warm, cozy appearance. Board and batten can enhance homes that have a cottage style, so if this is the aesthetic you’re going for, play it up with pastel porch accessories and bright white shutters. For residents of Charleston, South Carolina, and the surrounding area, tropical style is extremely popular. Light yellow, in particular, brings the island lifestyle to mind. Pairing sunny siding with aqua accents will give your home and instantly beachy appearance. You may also want to consider using palm trees and other tropical plants in your landscaping. This will complete the aesthetic. The team at Hatch Homes would love to assist you throughout your exterior renovation. We will be there every step of the way, whether you need help selecting the perfect yellow hue or just need someone to tackle your painting or siding job on your behalf. Our skilled crew is highly trained and brings all sorts of talents to the table. No matter what you need done to make your house into your dream home, we’ve got you covered. If you are planning to build a new home in the near future or you have a major exterior renovation on the books already, selecting an exterior color for your house is a decision you probably need to make soon. This is a big deal; it’s the first thing people will notice about your residence, so it’s important for it to convey everything you need it to, from the type of people you and your family are to the overall aesthetic you’re going for in your home. If you feel like this choice is looming large and you aren’t sure how to make a final choice, you’re in the right place. As you continue reading this short guide, you will see three key things you ought to take into consideration before you commit to an exterior color. 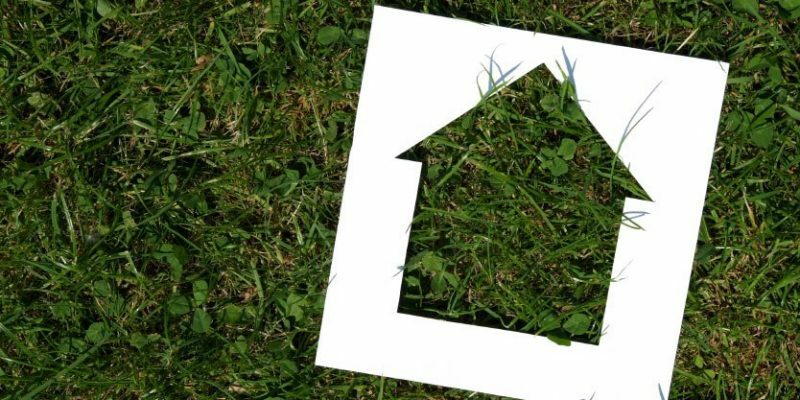 Hopefully, when you reach the end of the article, you will feel more confident about making the right decision for your home. If you need help at any point, though, remember that your contractor or a local designer will be happy to assist you. Take a look around your neighborhood – If you are moving to a brand new area, it is safe to assume you don’t know much about the other houses in it yet, but even if you’ve lived in your current neck of the woods for quite some time, you might not have ever spent time really looking at the other houses near yours. 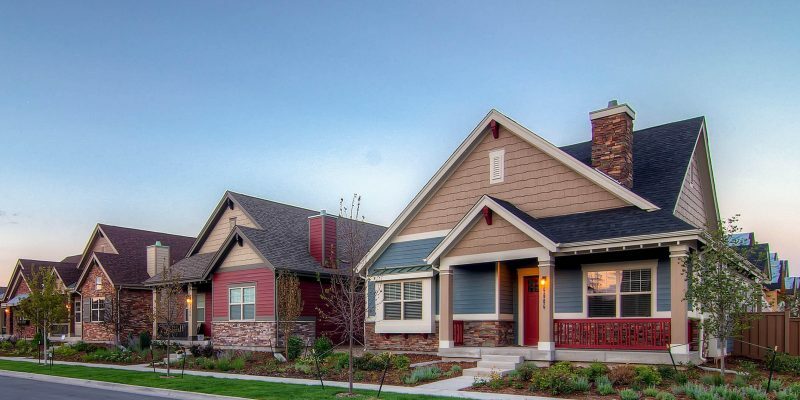 Purposefully driving through the streets surrounding your house and taking-in the appearances of all of the homes may help you decide on a color palette for your own residence. You might notice, for example, that certain combinations are especially popular where you live, giving your neighborhood a cohesive look. This can vary from region to region, but in the mountains of North Carolina, it is earth tones and stone facades, while coastal South Carolina tends toward pastel hues. Think about the architectural style of your house – Different architectural styles lend themselves to different exterior colors. Take a good look at your home’s aesthetic and, if it is historic, learn as much about its past as you can. This will help you select an appropriate outside color combination. If, for example, you reside in a Victorian house, choosing bold colors, such as yellows, purples, and blues, will be in keeping with the era. If, however, you live in a newly constructed suburban home, earth tones, such as tan and brick red, are likely to be popular. Don’t hesitate to join the bright side – Even if you aren’t willing to commit to a house that has a super bright color palette overall, bold touches can go a long way toward making your home stand out from the crowd in the best way. Colorful front doors are, perhaps, the easiest feature to add to all styles of homes. This is a great way to showcase your favorite color or take a prevalent accent color from inside your house and bring it outdoors, adding cohesion to your overall design scheme. At Hatch Homes, we understand that doing a full exterior remodel is a big commitment, but rest assured that we are here to help. Whether you need help figuring out what color combination you should choose for your home or you just need our team to execute your vision, we are ready for any projects you need us to do! Over the last decade or so, more homeowners than ever before have been choosing metal roofing for residential purposes. For quite some time, this roofing material was primarily used for commercial and agricultural applications, but that is no longer the case. If you are thinking about having a new roof put on your home in the near future, it is important to consider both the pros and cons of any material you’re seriously considering. Here, you’ll discover the perks and downsides of metal roofing in particular. Lifespan – Metal roofing is incredibly durable, with some of the top brands coming with 50-year warranties. Mid-grade styles typically still have 30-year warranties attached to them. The odds of ever having to replace your metal roofing are slim, even if you live in a hurricane-prone region like North Carolina’s Outer Banks. Metal roofs can withstand high winds, heavy rain, and even snowstorms. Relatively lightweight – Many popular roofing materials, including tile, are extremely heavy, which can make them difficult to install and, in some cases, lead to structural damage over time. Metal roofing, however, is relatively lightweight in comparison. To put it in perspective, tile averages 750 pounds per 100 square feet of roof, while most types of metal roofing weigh only 50 to 150 pounds for the same area. Flame resistance – Although wildfires are not a major concern in most parts of the Carolinas, other types of fires, including electrical fires, can impact everyone. One of the significant benefits of metal roofing is that it is resistant to flames, making it a great choice for homeowners who consider fire safety to be a primary concern. 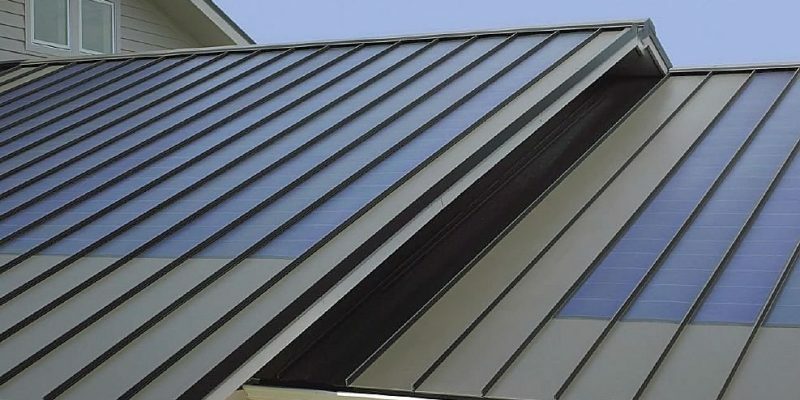 Reflective properties – Because metal roofing reflects the sun’s rays, it allows less heat into homes, ultimately reducing energy bills, particularly in the summertime. This is an important perk for both North Carolina and South Carolina residents, where hot, balmy weather can last for much of the year. Initial cost – The initial cost of metal roofing tends to be higher than that of other popular materials, particularly asphalt shingles. The most pricey options can cost as much as $600 per 100 square feet, with more affordable choices topping out around $200 for the same area. It is essential to bear in mind, though, that metal roofing lasts a long time, so the odds are good that you’ll make-up the additional upfront expense over time. Sound – While some homeowners adore the sound of rain pitter-pattering on a metal roof, others are not fond of the noise. If you’re worried about a metal roof being too noisy for your family, you should talk to your contractor about soundproofing options before you nix the material completely. There are numerous techniques that can be used, including using plywood sheathing and other sound barriers under the roof. Dents and dings – Though metal roofing is certainly durable, it isn’t completely indestructible. As it endures various weather events, including hail storms, which are common in some parts of the Carolinas, dents, and dings are likely to appear. This will not impact the structural integrity of your roof, but some homeowners find it unsightly. If you think a metal roof could be the right choice for your upcoming remodeling project, contact the team at Hatch Homes today. We will be happy to schedule a consultation with one of our expert team members so you can learn more about metal roofs and all of the benefits they offer in residential projects. With each new year come new interior design trends and, on the other side of the coin, former trends that it’s time to let go of. If you haven’t yet spent time thinking about the design ideas that should be nixed in 2019, you’re in the right place. As you read on, you’ll discover five past trends that are no longer in the forefront of modern decorating. Small porch columns – At one time, thin porch columns, often made of wrought iron, were extremely popular. Depending on the age of your neighborhood, in fact, you might still see these on a daily basis. Today, however, homeowners and decorators alike are turning to thick, statement-making columns instead. Whether you choose vinyl, stone veneer, or wood for your column material, thick columns will prevent your residence from looking outdated. Picking the right neutrals – Have you ever looked at a white, grey, or tan house and thought it just lacked a certain something? If so, the odds are good that the homeowner chose the wrong neutral shade for his or her residence. Picking the right neutrals is key to creating the visual impact you want when people pass your home. 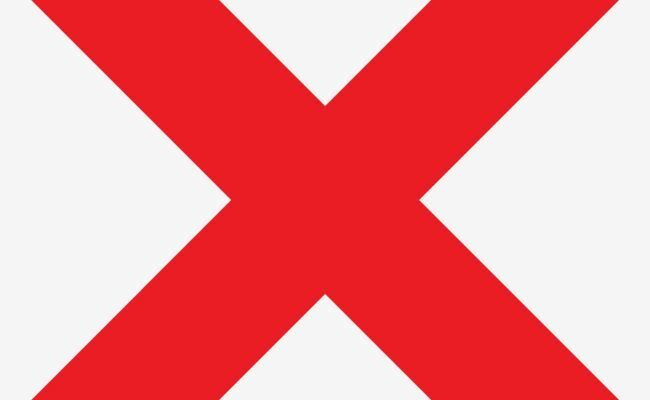 If you need help with this, speak to a local Carolina decorator who does color consultations. You will probably be amazed what simply changing the shade of your home’s siding can do, even if you stick with the same overall color family! Chevron patterns on soft furnishings – For half a decade or more, homeowners have loved chevron patterns on outdoor seat cushions, pillows, and rugs. Instead of continuing to use this rather overdone look, consider an ikat or Aztec-inspired pattern instead. Cheaply made outdoor furniture – Note that this doesn’t mean you have to spend an arm and a leg on your patio furniture; great deals can be found on high-quality pieces at stores both online and throughout the Carolinas. Because outdoor living is so important to most modern homeowners, though, it is important to get rid of cheaply manufactured outdoor furniture in lieu of well-made pieces that will stand the test of time. Using an excessive amount of colors – Using too many colors, especially on the outside of your house, can make it look unnecessarily old-fashioned. Instead of using different colors for the siding, the roof, the porch, and any trim stick to a palette of just a couple of hues, perhaps in varying shades. This will result in a sleek, yet timeless, aesthetic. The exception to this is if you are restoring a historic home, particularly from the Victorian Era, and you want to keep everything authentic to the period. If your home currently has any of the above features and you would like to alter them before 2019 progresses any further, the team at Hatch Homes is here for you! Simply call our office to discuss the project you have in mind and schedule a time to meet with our skilled team members about your job. We are proud of the work we do throughout the Carolinas, and we look forward to updating your home with a look you’re sure to love!